Gaza got game – game on! Israeli snipers kill at least seven Palestinians, wound over 300 others during the eighth day of the ‘Gaza Return March.’ Protesters attempt to block soldiers’ line of sight by burning tires. The killings came as thousands of Palestinian protesters amassed at the border with Gaza at noon, burning large amounts of tires in order to provide protection from Israeli snipers and tanks. Israeli security forces shot both live fire and tear gas at the protesters, while fire trucks sprayed water at the burning tires on the other side of the border in an attempt to put out the fires. The number of protesters was smaller than the precious Friday, with the demonstrators spread out across five different locations along the border. Solidarity protests are slated to take place in Jaffa and Sakhnin this weekend. While the Israeli army has portrayed the march as a violent provocation organized by Hamas, the march’s organizers have stressed that the march is an apolitical, non-violent protest against the unbearable living conditions in Gaza and demanding the Palestinian right of return. Friday’s demonstration comes a week after snipers gunned down 17 protesters on the border, and wounded hundreds of others. Despite international criticism and calls for an independent investigation into the killings, Israeli authorities have doubled down on the decision to use live fire against unarmed protesters — vowing to repeat the same tactics that led to so much bloodshed a week earlier. In a newspaper ad campaign published late this week, human rights group B’Tselem urged Israeli soldiers to refuse orders to open fire on protesters. Inside Gaza, Palestinians built a tent encampment with different tents corresponding to the various villages and towns that were destroyed during the Nakba (in Arabic, the catastrophe), in 1948. During the 1948 war and its aftermath, more than 700,000 Palestinians were expelled or fled from their homes and Israel subsequently destroyed almost all of their homes and villages. Palestinians sit in a tent encampment built to represent the various villages and towns that were destroyed during the Nakba in 1948. Some 70 percent of the Gazan population are refugees, meaning they or their grandparents fled or were expelled from towns, villages, and cities inside the territory that become Israel in 1948. Speaking to +972 Magazine before the first day of protest last month, one of the ‘Great Return March’ organizers, Hasan al-Kurd, explained that the plan was to set up camps between between 700-1000 meters from Israel’s border fence, outside the Israeli army’s unilaterally imposed buffer zone. In the weeks leading up to Nakba Day, there will be marches and bicycle races and other events every week, aiming to draw more attendees along the way. By mid-May, they hope hundreds of thousands will join. Even before the march began, however, Israeli security forces launched a public campaign painting the ‘Great Return March’ as a violent, Hamas-sponsored event. The Israeli army’s chief of staff announced the deployment of 100 snipers and several infantry brigades to the area of the Gaza border fence. Israeli generals warned that there will be casualties, which turned out to be all too true. On Land Day and Nakba Day in 2011, thousands of Palestinians from Lebanon, Syria, the West Bank and Gaza, and inside Israel marched on the country’s borders. On the Lebanese, Syrian, and Gaza borders, the army responded with gunfire, killing dozens and wounding hundreds. The same army that boasts of its progressive attitude toward women changes its tone completely when addressing an Arabic-speaking crowd. IDF Spokesperson in Arabic Maj. Avichay Adraee tells Palestinian women: Your place is in the home. It is astounding that the IDF Spokesperson adopts such conservative attitudes toward women. The same army that boasts of its progressive attitude toward women — and the equality it offers them in combat units — completely changes its tone when addressing an Arabic-speaking crowd. It’s a classic combination of paternalism toward Palestinians, whom Maj. Adraee must think are either primitive or stupid, and male chauvinism that actively tries to oppress women. All in the name of putting down a popular protest movement in the Gaza Strip. GOP again proves that your freedom is the last thing it really cares about. You don’t want someone fracking in your neighborhood? Don’t waste your breath at City Hall: No Ohio mayor can do much to help, thanks to a 2004 law that pre-empted local control of oil and gas drilling and to those who voted for it, writes Thomas Suddes. Not Pearl Harbor but… old super-nationalism still simmers among wannabe samurai. SASEBO/TOKYO, Japan (Reuters) – Japan on Saturday activated its first marine unit since World War Two trained to counter invaders occupying Japanese islands along the edge of the East China Sea that Tokyo fears are vulnerable to attack by China. Until about 15 years ago, cats were thought not to be susceptible to human or avian flu viruses. All of that changed in 2003 when zoos in South-East Asia that kept large cats found out to their dismay what happens when you feed H5N1 infected chicken carcasses to tigers and leopards. The following comes from a World Health Organization GAR report from 2006. In 2006, virologist C. A. Nidom of the Institute of Tropical Disease, Airlangga University demonstrated that of 500 cats he tested in and around Jakarta, 20% had antibodies for the H5N1 bird flu virus. Findings that prompted the FAO in 2007 to warn that: Avian influenza in cats should be closely monitored. Since then we’ve seen ample evidence that cats – including pets – can be infected with both avian and human flu viruses. During the 2009 H1N1 pandemic we saw several reports of feline infection, and in late 2010 we saw a study (see EID Journal: Pandemic H1N1 Infection In Cats) that looked at the pathogenesis of novel H1N1 in domestic felines. Intratracheal infection of domestic cats with pandemic (H1N1) 2009 virus resulted in mild-to-moderate clinical signs and virus replication throughout the respiratory tract that caused diffuse alveolar damage. Pathogenic changes in the respiratory tract in cats were similar to those that occur in humans, macaques, and ferrets (7,11–13). 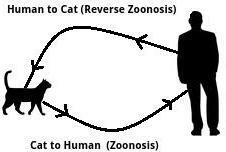 Seroconversion of sentinel cats indicated cat-to-cat transmission. While we saw a rare zoonotic transmission of avian H7N2 from a cat to a human in New York City in late 2016 (see EID Journal: Avian H7N2 Virus in Human Exposed to Sick Cats) – along with vigorous with cat-to-cat transmission – companion animals are far more likely to contract seasonal flu from humans (reverse zoonosis) than to give it to people. Which brings us to a rare report this week of two fatal H1N1 infections in cats from a single household in Connecticut. Reportedly, both cats had pre-existing conditions, and the owner of the cats had recently been sick with a flu-like illness. Sadly, some in the media still insist on calling seasonal A(H1N1) `swine flu’, particularly since there really is a swine H1N1 on our radar. But I digress . . . The H1N1 variant of the influenza virus, previously known somewhat inaccurately as “swine flu”, is contagious to cats as well as to people. In addition, this virus is also known to be able to infect dogs, pigs, and ferrets. Though the spread of this particular influenza virus is no longer considered to be an epidemic of emergency proportions, it does continue to spread worldwide. Symptoms may range from very mild to extremely severe and some infected cats may show no signs of disease at all. Some cats infected with H1N1 influenza have not survived, but the majority of infected cats suffer mild to moderate symptoms. While the risks are low, you may want to reconsider the next time you are down with the flu and are tempted to curl up with a beloved pet.